They’re backing another pointless – and potentially harmful – McLawsuit by the group that calls itself Children’s Rights. Here we go again. The group that so arrogantly calls itself Children’s Rights (CR) – while ignoring children’s right to their own families – has filed another of their McLawsuits against a state child welfare system. Nothing unusual in this. But one of their allies in the suit ought to know better. For them, signing onto the suit is a betrayal of their own stated mission. 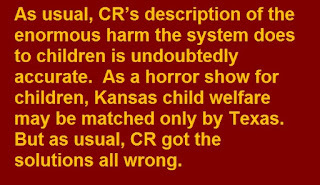 CR’s McLawsuits reflect the finest thinking of the 19th Century – when self-proclaimed “child savers” rushed to take impoverished children from their supposedly unworthy, unfit parents. That’s still the norm today. 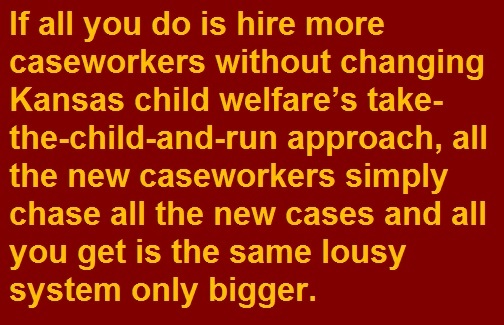 But instead of working to curb these practices, CR lawsuits aim to “fix” foster care largely by throwing more caseworkers and more paperwork at the problems. 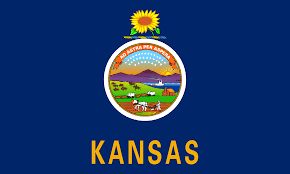 What’s the matter with Kansas child welfare? This time the target of the lawsuit is Kansas. As usual, CR’s description of the enormous harm the system does to children is undoubtedly accurate. 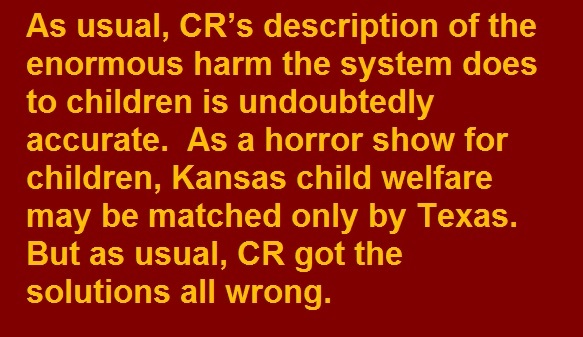 As a horror show for children, Kansas child welfare may be matched only by Texas. But as usual, CR got the solutions all wrong. The lawsuit ignores the problem that drives everything else: The system is inundated with children who never needed to be taken from their parents in the first place. CR always ignores this. But it takes a particularly willful measure of ignorance to ignore it in Kansas. 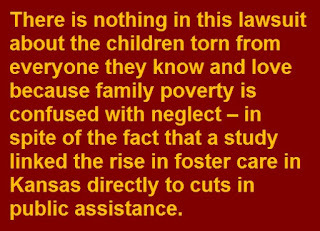 Even the former head of the Kansas child welfare agency effectively admitted, albeit inadvertently, that there are plenty of children in Kansas foster care who don’t need to be there. And what does CR’s 68-page lawsuit complaint say about this? Not one word. After documenting some of the most horrific problems in any foster care system in America, the solutions called for by the suit are mostly requests for injunctions barring the state from doing things such as moving children from home to home night after night, sometimes more than 100 times. But Kansas can’t stop doing that until Kansas stops taking too many children needlessly. They also seek a study to tell us what we already know -- that caseloads are too high -- followed by the usual caseworker hiring binge. 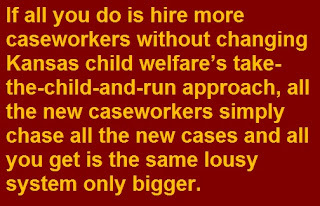 But if all you do is hire more caseworkers without changing Kansas child welfare’s take-the-child-and-run approach, all the new caseworkers simply chase all the new cases and all you get is the same lousy system only bigger. And it can get even worse. All those caseworkers cost money. That’s fine, I’m all for spending moresmarter. But CR has an unfortunate habit of demanding more spending without putting any limits on where the money comes from. So at least two states complied with settlements of CR lawsuits cutting aid for poor families. The founder of CR, Marcia Lowry once famously said she doesn’t know how to fix poverty but she knows how to fix foster care. In fact, there’s no evidence she knows how to fix either one. Sometimes her lawsuits actually made the poverty worse. Though Lowry is no longer with CR, this latest suit is typical of the kinds she brought. So there’s nothing to prevent the Kansas suit from making poverty worse. But this lawsuit does nothing to defeat either and may worsen both. 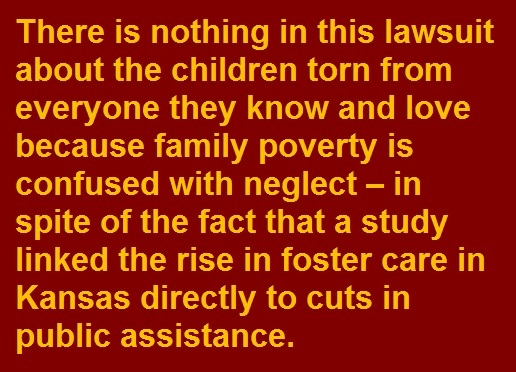 ● There is nothing in this lawsuit about the children torn from everyone they know and love because family poverty is confused with neglect – in spite of the fact that a study linked the rise in foster care in Kansas directly to cuts in public assistance. ● There is nothing in this lawsuit about the racial bias that permeates child welfare. ● There is nothing in this lawsuit about providing concrete help to families instead of simply hiring new caseworkers to do exactly what the old caseworkers do – needlessly tear apart families at an obscene rate. And Kansas Appleseed is not alone. Over the years, Appleseed groups in two other states have joined similar McLawsuits. Perhaps they were lulled into joining by CR’s oft-repeated claim that you can’t sue on behalf of children not yet in the system. In fact, you can – as evidenced by the fact that CR itself has done it. And there’s still a way to do it in Kansas. Most of these McLawsuits are resolved through negotiations. The resulting agreements usually involve a lot of pointless micromanaging and, of course, the caseworker hiring binge. But it doesn’t have to be that way. Kansas Appleseed can be true to its stated mission by insisting on an Alabama-style resolution to the case - instead of what usually follows a CR McLawsuit: A CR McSettlement.